I've met author and Illustrator, Kevin Henkes, several times. Each time I'm impressed with his humble attitude and easy-going personality. Over the years, as a children's librarian, I've read many of his books to students. Chrysanthemum, Lilly's Purple Plastic Purse, and Owen were staples on my reading list. I've also enjoyed Henkes's chapter books, Olive's Ocean and Sun & Spoon. Of course I'm partial to his Penny books. But I think my favorites are his recent books where he uses brown ink, colored pencils, and water color to create gorgeous pictures of adorable characters and tells sweet stories. At a visit at the Blue Marble bookstore, Kevin explained that Old Bear had been inspired by the inevitable life event of aging. A book I relate to! 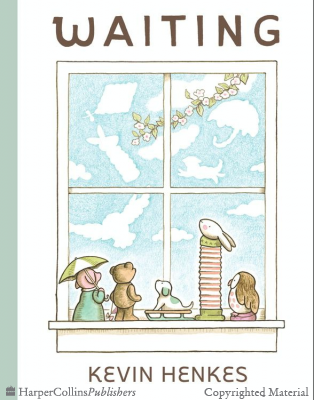 My latest favorite is called Waiting. In San Francisco I met Kevin Henkes once again and received a signed copy of a print created from a page in Waiting. I carried that print home on the airplane, framed it, and hung it in a prominent place in my home. While I had the beautiful print, the book was not yet available. So I waited on Waiting. AND it was well worth it. I love it. The beauty of being patient and spending time with friends is lovely. The sweet illustrations remind me of porcelain animals I played with at my great-aunt's home. 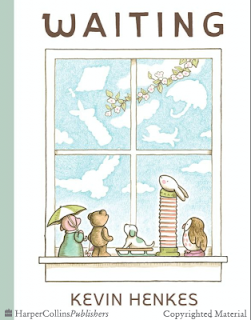 Waiting won a Caldecott Honor and the Theodore Seuss Geisel Honor. Both well warranted. This is a beautiful book to read to a child or just add to your collection.